Check Out Our Interactive Exhibits! Starting in 2017, we launched a full redesign on all of our exhibits within the museum. Our goal has been to make our displays modern while presenting our history in an interactive format. Below are several examples of our brand new exhibits, which have delighted thousands of visitors and expanded our community’s knowledge on the history of Boone County. Our brand new exhibition gallery features activities for kids of any age! 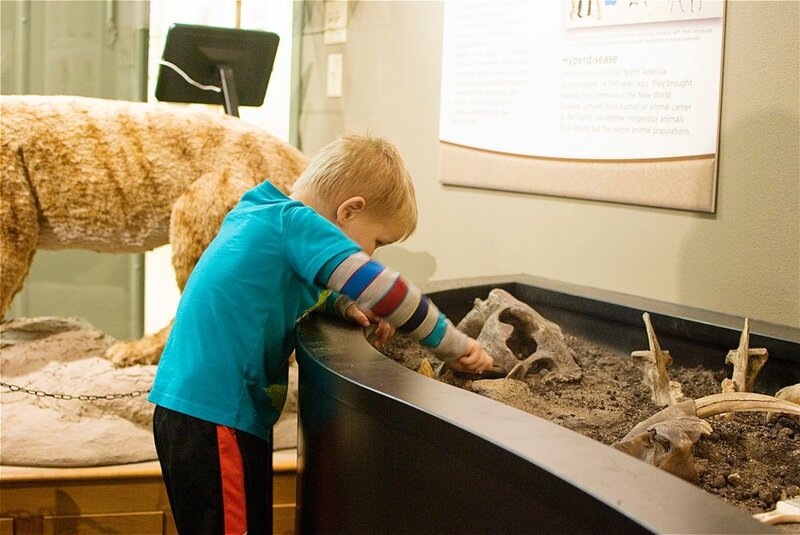 The exhibits include a dig-your-own fossil site, hands-on interactive learning drawers and the chance to see a real Wooly Mammoth thigh bone that was found in Boone County. Our new Gallery also features wonderful taxidermy that has been overseen by Jim Hess (Hess Taxidermy Studio). Jim has spent his entire career in taxidermy and has won numerous awards for his skill, both state-wide and nationally. The night Judi Ford won the title of Miss America 1968, Belvidere exploded into an excited frenzy. Judi Ford, small town girl who had grown up in Belvidere, had won the title and put the city’s name on the nation’s map. Explore our new exhibit that dives into Judi’s life growing up in Belvidere as an expert gymnast, to her historic win, and her current life as a retired teacher and grandmother. The exhibit also features a recreated 1960’s living room where you can sit and watch Judi win on a 1950’s television! This is our newest exhibit that is still under construction. Join us July 6th at Noon for the Grand Opening! Sowing Season will feature interactive elements for kids such as a farmers market, a cow that can be milked, a farm themed sensory path and more! Other elements will include a full history of the dairy industry in Boone County and a dedication to the famous Edward’s Apple Orchard, whose founder was a dedicated member of our museum. We can’t wait for you to see this exhibit!